I’m becoming progressively more rested at the start of each new day. I was, however, woken up this morning somewhat prematurely. Sandy came into the bedroom (she’s always up early with the kids) to wake me up and remind me that we signed up for the Tuesday morning pancake breakfast organised by the resort here – and that it’s now Tuesday. I leapt into action, at least as far as a middle-aged, overweight and slightly balding man who’s not a morning person can, and we all made our way over to the common room. As our unit is immediately next to the common room, this took all of about eight seconds. What awaited us was a canteen full of around 20 other guests and a buffet of pancakes, cereals and other breakfast things. The pancakes were quite thin but very tasty nevertheless and plentiful. We all gouged ourselves accordingly. Earlier in the week, I had paid $5 each for this event, which I thought was good value in the grand scheme of things. After the pancake breakfast, we pottered around a bit before Joey and I got organised for a spot of fishing by the lake. We all went but Sandy and Jennifer took the car and left Joey and me to set up. I made sure to find a spot next to the lake that was particularly devoid of overhanging trees. 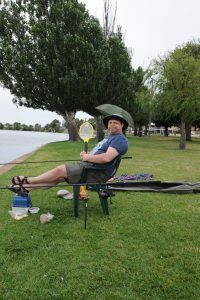 Despite the fact that the flies were out in force here as well, I at least had all the fishing tackle set up correctly already. All I had to do was to bait the hooks and cast. I sat in my borrowed chair and was just settling into my wafting routine. Joey started to complain about being bored. This wasn’t totally unexpected. It had already been nearly 20-25 seconds since I sat down and got comfortable after all. I did my best to keep him engaged and I was doing reasonably well but after about 20 more minutes, he begged me to call Sandy to come and collect him, which I did…happily. 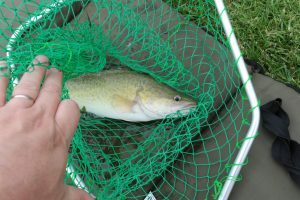 The net result of this was that I was again left to fish in quiet solitude. Just me, the calm waters of the lake and a gentle breeze to keep me company. Oh, and about eight thousand flies all itching for their turn to try flying up my fecking nose! Notwithstanding the flies, the serenity of the fishing eventually took hold and I was at peace with the world once more. After about an hour, I even landed my first, and, as it eventually transpired, only, fish of the day. It was about the same size as the one I caught yesterday. It wasn’t the same type of fish, though. In fact, I’m not entirely sure what it was but it didn’t matter. I had caught a fish and this meant I was a real angler. Life doesn’t get any better than this. In my zen-like trance of at-one-with-the-world, I casually glanced at my phone. There were two FB messages and three SMS messages from Sandy – each progressively more desperate than the last. It seems she is trying to contact me to convey some sense of urgency - something to do with the key to our unit and whether I had it with me. We only have the one. I didn’t have it. I called Sandy. The audible onslaught that greeted me down the phone might have perturbed me at another time but I was fishing, at peace with the world and nothing could penetrate that. I in fact hadn’t laid eyes on the key at all today, nor had it been in my possession. I reassured her, quite calmly I might add, that I didn’t have the key, and thus she must have it. The clear, albeit unintended, inference being that she either hasn’t looked hard enough or she has lost it. Was that the right thing to do? Hmmm. Conveying this to Sandy would have done two things. First, me not having the key meant that she had nobody to blame and the immediate loss of a target would quite possibly have heightened her frustration. Secondly, it would have conveyed the message that this wasn’t a problem I was going to be able to assist with. I am, after all, fishing. In the long run, neither of these things was realistically going to bode well for me but, again, I was fishing. Did this mean they were locked out? Did this mean we would have been charged some indeterminate figure for a replacement key? Did I care? I…was…fishing. I take a deep breath and relax back into my state of calm. Another half hour goes by and I casually turn my head to find Sandy and the kids walking towards me from the car park. They are surprisingly calm and relaxed. Did you find the key? Yes. Where was it? On the floor over there near where the car is parked. Evidently it had fallen out of Sandy’s pocket when she dropped us of earlier. I maintained a neutral expression and said nothing. It was the best defence I could muster at that point. Thirty years of married life has taught me that sometimes the best course of action is to not dig the hole any deeper by simply shutting up. I packed my fishing paraphernalia away and we all carried bits of it back to the car. Back at the unit, another dip in the inside pool was on the cards so I joined the kids and got in myself. Although still quite warm here, it’s an overcast day. The lack of direct sunshine and a mild breeze meant that it was a tad too chilly for the outside pool, which was devoid of any activity from the other guests as well. It was now around mid-day. For lunch, we whipped up some sandwiches from provisions Sandy had procured a little earlier. Joey’s proclivity for under-reporting any physical ailment means that our ears tend to prick up whenever he does complain about something. We came close to taking him to the doctor a few days ago when he was complaining about a pain in his groin. This has gotten progressively better over the past couple of days and I had assumed it was just a strained muscle or something that had now healed. When he started complaining about his ear hurting again yesterday, however, we were doubly nervous since he only just completed a course of anti-biotics for a double ear infection. Rather than take a chance with this, I booked him in to see a local doctor for this afternoon to have him checked out. I took him over to the nearby doctor’s office for our 2:30pm appointment. After a bit of paperwork and about a fifteen-minute wait, we got to see the doctor. She was very good and the upshot is that Joey doesn’t require any additional medicine. She thinks the pains in his leg are a result of swollen glands. That plus his ears ears are both perhaps a symptom of a broader viral infection that he’s been fighting. Other than to put some ear plugs in for when he’s swimming (it’s apparently the temperature difference and not the water that’s the issue there), there’s little of concern and we can go about our holiday. I guess it’s always better to be safe than sorry and I considered it $25 (after rebate) well spent. Our last item for today before our evening meal is somewhat sombre. For the past five days, I’ve withheld various things from my blogs that have been big parts of our experience here. If anything, I have masked it with the humour I have tried to build into my daily updates. This has been deliberate but the time is now right to reveal a little of what has been going on behind the scenes. Sandy’s mother passed away just a few days ago and Sandy has been grieving. Today, we agreed we would celebrate my mother-in-law’s life. Sandy and the kids each wrote some memories onto paper and we all constructed some floating boats to let loose on the lake. 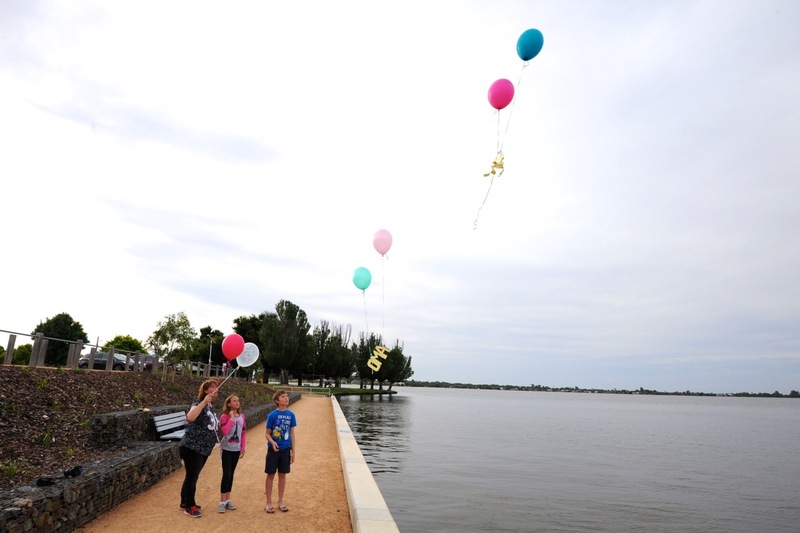 Sandy bought some helium-filled balloons and we planned to tie the memories to them and release them. We made our way down to a spot on the bank of the lake and ceremoniously said our farewells to Beppie, or Oma (grandmother in Dutch), as the kids know her by. It was a very tender and teary-eyed affair but it served a very important and necessary purpose. 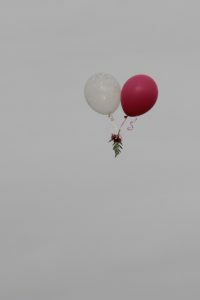 Watching the balloons take to the air, each with their payload, was very touching. We stayed and watched for as long as we could see them carried into the air and long enough for our paper boats and butterflies to gently blow away onto the lake. Rest in peace, Beppie. You will be missed but still loved. Having said our goodbyes to Oma, we got back into the car and drove across the bridge into New South Wales to continue our celebration of Beppie’s life with a nice meal. Right on the other side of the bridge is Club Mulwala, an RSL establishment, where we planned to have our evening meal. 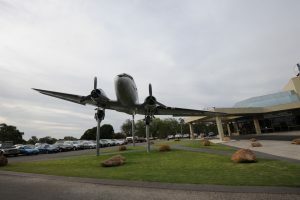 It’s hard to miss – especially as there’s an actual WWII aeroplane raised up on pillars adorning the main entrance. Along with several tanks and other military arsenal dotted about the grounds, it’s quite a sight. By this time, Joey had pretty much gone into shutdown mode. He became non-compliant, obstinate and outright defiant. The speed at which this transformation took place was quite remarkable. In fact, he eventually just broke down into tears and literally sat on the floor and refused to move. We recognise this behaviour and even understood the trigger. Between him being hungry, in an unfamiliar place and now with the emotional turmoil of what had just happened with saying goodbye to Oma, it was all just too much for him and he was unable to cope with it all. This can be hard to deal with but we did our best to be patient with him given the circumstances. We gave him some space and allowed him to calm down. The time it took for us to order and receive our food was enough to get him somewhat calm. Within five minutes of him eating something, he was again a completely changed little boy – happy, interactive and once again bubbling with life. The speed of this transformation back to normal again was no less as swift as the initial change in his behaviour. It’s just something we’ve had to learn to deal with over the years. Our meal at the Mulwala RSL was absolutely beautiful. The food was delicious and plentiful. From the balcony outside the main restaurant floor, we had a terrific view overlooking the lake. 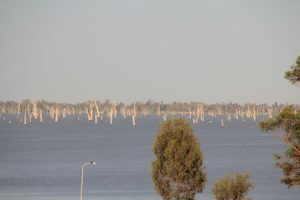 On the NSW side of the lake, there’s an enormous section that is punctuated by eerie-looking dead trees. There are dozens of them jutting up out of the water and all spaced out randomly from each other. The paddle steamboat that ferries tourists around visits this section of the lake to show people this unusual phenomenon. We might take a trip on that boat before we leave town in a couple of days. 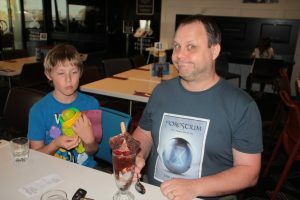 We finished our meal and time at the RSL, as Beppie would have loved, with a couple of tall chocolate fudge ice-cream Sundays. As I sit here typing this, I think I can actually feel my arteries hardening. The menu at the restaurant said something about signing up for RSL membership for just $5. Each menu item is about a dollar or two less for members so $5 seemed very little to ask for the privilege. Since there are dozens of RSLs all over the nation, we decided to sign up. We each filled in a form at the main reception on the way to the car but it wasn’t until after the very friendly receptionist handed me our cards that the penny dropped. The membership was for this RSL only and not nationwide. Since we’re unlikely to come back here again anytime soon, I apologised and returned the cards. Having finally developed something of a memory map of the area, we took the back roads from the RSL back to the resort, which took us across a smaller, single-lane bridge that was operated by traffic lights. We’ve now settled in for the night, the bedtime routine is done and the kids are now happily asleep. Sandy, bless her, has just folded a load of washing and I’ve just finished typing up todays events. I think we will sleep well tonight.